Matt Mendez won a WSOP bracelet last weekend and wasn't anywhere near Las Vegas or a casino when he did it. (Borgata photo). Every year, the World Series of Poker brings out all kinds of storylines as players, professional and amateur alike, come from varying backgrounds to win one of poker’s most coveted prizes, a WSOP bracelet. 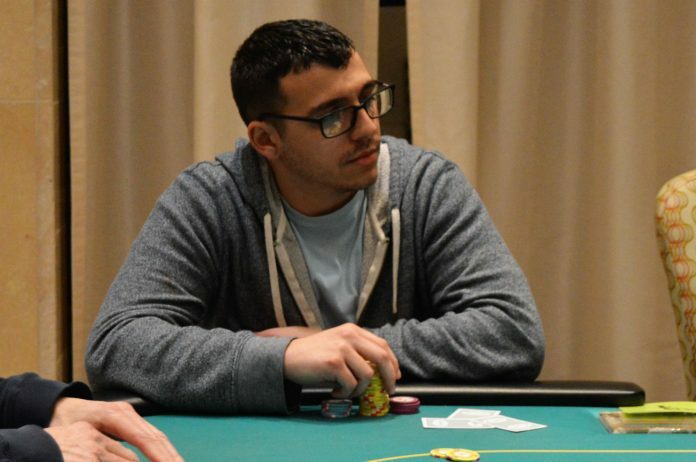 Matt Mendez, winner of the $565 Online Six Max Pot Limit Omaha event, is one of those stories. Actually, he’s more than one. He’s a stay-at-home parent with a young daughter. He’s an online grinder who recently rediscovered his passion for poker. He’s dreamed of winning a WSOP bracelet of his own – more than one actually – since he was 12 years old. As if all of that didn’t make for an amazing storyline following his victory, Mendez also made history as the first player to win an online bracelet while playing in New Jersey. That event wrapped up Saturday morning after 15 hours of play. Even though his wife, Victoria, was already late for work and her boss was looking for her, Mendez implored his wife to stay and see it play out. No matter how it ended, he wanted her there. On the final hand, Mendez flopped a straight and checked the action to his opponent. He had a feeling his opponent was going to shove and that’s exactly what happened. Players typically fall into one of two categories in the immediate aftermath of a bracelet victory. They’re either elated and are running on a high that would make Post Malone jealous or they’re so physically and mentally exhausted that they simply crash and catch up on sleep. With his daughter ready for her day to start, Mendez basically fell into the former category, even if he could have fallen into the latter. With his wife on his way to work, Mendez had to get on the phone and let his first poker teacher know that he’d won. His Aunt Michelle was on the other end of the call. “She was bawling her eyes out. She was so excited. We’ve always talked about bracelets. Since I was 12 years old, that’s what we talked about, ‘you’re going to win bracelets’. I used to say I was going to win 20 when I was a cocky 12-year-old,” said Mendez, now 28 years old. His aunt and uncle taught him Seven Card Stud when he was just five years old. It wasn’t “poker” or “stud” though, they had their own name for it. “I would call it Cards and Chips, it’s just what we did. I’d go visit every summer and we would play Cards and Chips on the poker table and it evolved to games like Gin, Black Maria and a bunch of other card games. That’s just what we did as a family – we played cards,” said Mendez. His love of poker skyrocketed when he saw Robert Varkonyi win the 2002 WSOP Main Event on ESPN. He was 12 years old. “I was hooked at that point. I read Super System at that age. I started playing, I think it was called PokerRoom.com, where they had Limit sit-n-gos . My aunt and uncle, we would all play the free ones. We’d all register at the same time and play those nine-man Limit sit-n-gos,” said Mendez. He actually lived with his aunt and uncle through his high school years. He moved back to Florida with Victoria after they were done high school and then bounced back to New Jersey when they had a baby on the way. The move allowed Victoria to work full time after having the baby and Mendez could play online and be a stay at home dad. His view on the life of a traveling poker pro changed dramatically after Mathai was born. Mendez isn’t overly comfortable with the title of “poker pro: though. He’s a dad first, and the chips and cards thing is secondary. It’s still how he makes his living though, and he noticed about four months ago that players around him were playing at a higher level and continuing to get better. Now playing four or five nights a week, Mendez also spends a lot of his time studying as much poker as he can. During the day he’s at home taking care of Mathai and figuring out how to make all of it work has been harder than constructing three-bet ranges. Mendez will receive his bracelet later this week in Las Vegas. The WSOP is flying Mendez and his family out for the ceremony. Excellent job Matt. Congrats. Well deserved. So happy for you. wow what an article. great job man and have fun celebrating with the family.